I am still not sure how we can call it morning when the sky is dark and the stars are out but I was up early to drive Lee to work this morning (sometimes he just can’t organise a ride). But this morning it was somehow not as hard to be up (once I’d showered and dressed at least)! The stars were beautiful and coming back home the sunrise was also beautiful. And now its not quite 10am and I’ve made a batch of potato, leek & bacon soup for later and a batch of my raspberry, coconut and white chocolate muffins – Lee’s mates are dropping in later for a cuppa so thought it would be nice to be able to offer them something with it – and hey I just felt like baking. The estate agent came around yesterday to do an apraisal and tell me what I should fix up before I sell the place. The bricklayer had been in the morning just before hand to fix some stuff – I had a window bricked up but someone who said they could lay bricks…..but couldn’t as it turned out – it was terrible – now all fixed and not to expensive. I have to put the rangehood up in the kitchen (which means finally finishing that little spot of plastering) but other than that just tidy up and tame the garden, declutter as much as possible. My predictions of value were fairly on the money with theirs….not worth terribly much but I still have a fair bit of equity so should have a good deposit for our new place. Survived the school holidays – well it wasn’t too hard as kids went to holiday program a fair bit. 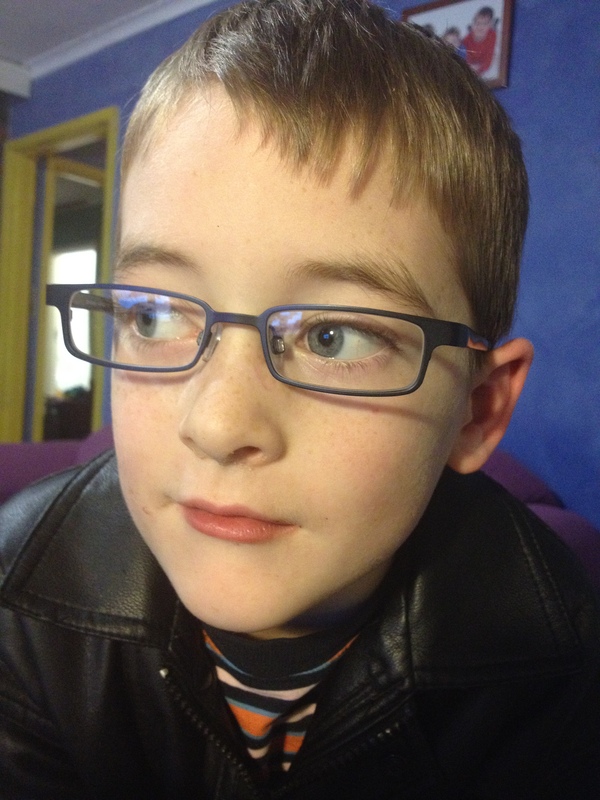 Corey lost his glasses during a holiday program excursion to the movies – they were very apologetic – but I wasn’t too stressed – they were falling apart so I was going to get him in for an eye test anyway. Gotta love spec savers – ordered on Saturday and he was wearing them Wednesday afternoon! It should be noted that the jacket he is wearing in the photo was bought for his cousin Nic when he was about 5, it was worn by Eriq later and by Owen and Brett and now Corey so that’s at least 5 boys who have been ‘cool dudes’ wearing it! Just a note about the book depository	I should be writing my essay…. Sounds like things are moving along nicely! !